Shooting survivor on Trump: "Never been so unimpressed with a person in my life"
Should we be surprised that Trump has a problem relating to ordinary people? On Wednesday, President Trump held a listening session with survivors of shootings around the country in the wake of the Marjory Stoneman Douglas High School shooting in Parkland, Florida. The White House's stated goal was to start the conversation about preventing more shootings. But the goal was also to show that the president actually cared about other people — especially people who are suffering. That's likely why Trump was seen holding a card reminding him to tell those affected by tragedies that he hears them. 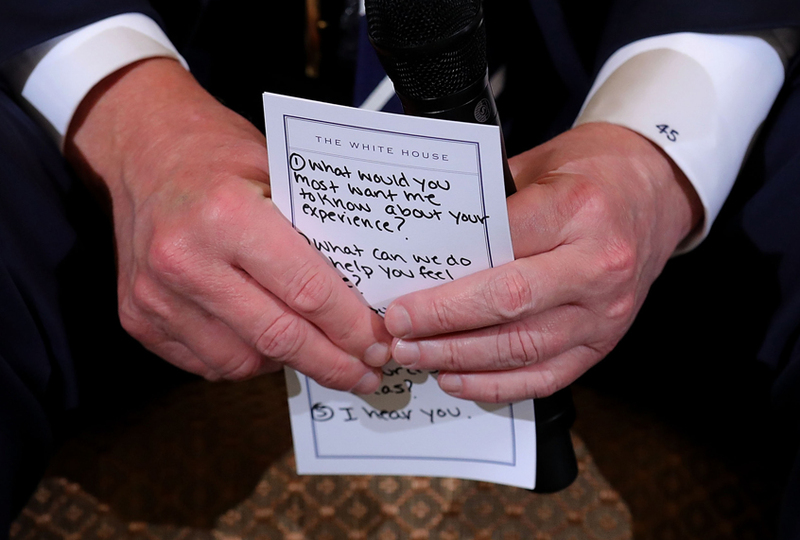 That card, according to the New York Times, with its impeccable handwriting, was crafted by Hope Hicks, Trump's longtime aide and current communications director. It didn't go over well with some survivors, like Samuel Zeif. “He may have heard us, but he’s never going to feel what we feel, because his kids are protected by the people that came to save me and my classmates that day,” he added. So now, after questions about President Trump's mental health and the skeletons in his closet, it's time to wonder whether he is actually capable of empathy for people he has never met before. After all, this is a president who got into a public feud with the wife of slain Sgt. La David Johnson, after she said that Trump apparently did not remember her husband's name. After all, this is the president who went to Puerto Rico for a grand photo op after a devastating hurricane — throwing paper towels and having a grand time doing it. But real empathy isn't a public performance, and Trump's response to the ongoing humanitarian crisis in Puerto Rico has been to ignore the problems while repeatedly complaining that he's not getting enough credit. Meanwhile, as with every disaster Trump has faced while in office, Americans have soured on his handling of the situation. According to a CBS News poll, only 33 percent of Americans approve of how Trump has handled the Florida school shooting. Of course there's a sharp partisan divide: About seven in 10 Republicans think he did a good job, while only 7 percent of Democrats say so. So here's the Trumpian strategy for dealing with any disaster. The first step is to address it on Twitter, as if he were just a random person watching Fox News, and not the leader of the free world who should instead be in a meeting to figure out the federal government's response. Then he travels to the scene of the tragedy, making sure to visit with first responders, whom he'll call incredible and generally praise. Add in some meet-and-greets with survivors and doctors in hospitals (some with a big smile and thumbs-up). Then it's time to declare mission accomplished and get back to the normal routine, to the extent that ever exists. Nothing about the president's response to the Florida shooting suggests this will be any different. But the survivors seem even less impressed this time around.